Graded MINT 9 by PSA. This is one of ten examples at its tier (with one graded higher) among a total of more than 4,075 copies recorded in PSA's census reporting. 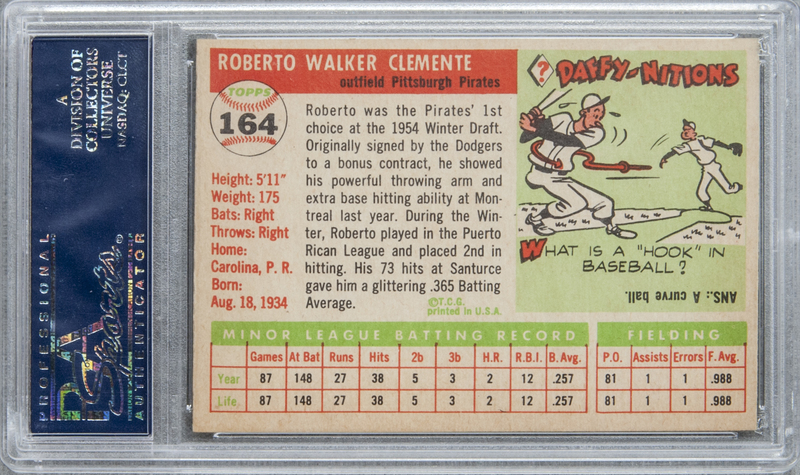 This cherished Clemente collectible was included in the difficult "High Number" segment of the 1955 Topps issue. Although the Hall of Fame outfielder's career was tragically abbreviated, his dual legacy of baseball greatness and humanitarian generosity remains immortal. Its marvelously well-calibrated centering provides an ideal, snow-white framing of Clemente's portrait and batting stance. 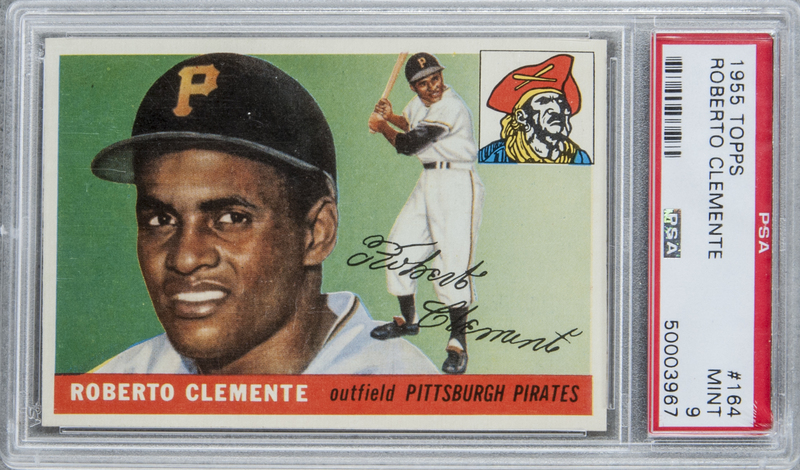 His bold facsimile signature and the colorful Pirates' logo enhance the item's lovely aesthetic. Clemente's facial image is compelling in its focused presentation, and the cardfront's bright colors captivate the observer. The snow-white borders culminate in sharp points, and the piece's reverse is clean and legible. This attractive specimen of Clemente's first Topps card would be an enviable addition to the finest assembly. A showpiece collectible, in undeniable Mint Condition.